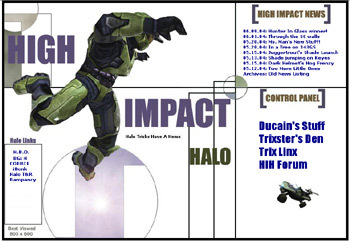 High Impact Halo (HIH) began in early 2004 as a little experimental site (looked horrible back then) that I used to display my Halo CE (Halo 1) trick videos. 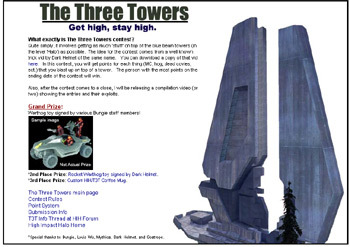 Back then, Halo 1 was a couple of years old, and the folks who messed around with Halo 'tricks' had mostly moved on. I arrived late in the game, and started recreating the amazing stunts and tricks that I'd seen in videos done by Dark Helmet, FrogBlast, and many others. I started communicating with an HBO forum regular named vshields_ash, and he really encouraged me to keep trying new stuff, and we would share ideas, via email, a few times a week. Halo was a relaxing escape. I remember feeling great about getting to the bottom of the maproom shaft alive in the level Silent Cartographer, and then this guy says, "Hey, not bad. Now get down there with no health loss and 2 live marines." Hehe, that's vshields_ash. I haunted the HBO forum primarily at that time, and through the encouragement of guys like LouisWu, Mythica, vshields_ash, goatrope and others, I kept banging away at the little project site, and even put up a stock phpBB forum after awhile, though I doubted anyone would ever visit it. Thanks to amaroq (owner of Mythica.org), you can look up the HBO forum post where HIH was first announced to the 'public'. He dug that up for the guys on our forum, and I thought it would be cool to post here. As it turns out, there was a steady little group of people that would stop by our little Halo 1 tricking forum, and the place turned out to be a good spot for likeminded folks to hang out. Not many people were really interested in 'tricking' but us, and so it gave the forum a nice focus. 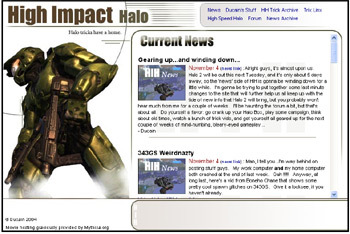 Like so many other Halo sites on the net, we really owe much of what we are to Halo.Bungie.org, who not only promoted our site time and time again, but also provided hosting for us from time to time for images and videos, when our bandwidth was...gone. Remember kids, this was back before the days of YouTube. If you wanted to share a video with the world, it was a much different process. The guys at HBO saved our bacon more than a few times, and we luv 'em. To make a fairly long story a little shorter, we fast forward to Halo 2. Honestly, the increase in traffic, and the increased interest in tricking the Halo 2 maps surprised us all. Our little corner of the world truly exploded, with thousands of people submitting video and images to us of their Halo 2 exploits. Xbox Live of course played a HUGE role in this explosion of content, since everyone and his 10 brothers could now jump online and try all kinds of cool stuff. Our forum was flooded with new content, and it was literally all we could do to try to keep up. Trying to moderate the forum and keep the front page of the site loaded with all the newly discovered goodness was dizzying. It was exhaustingly cool. Couple all that with the fact that our site was mentioned in a couple of fairly well-known gaming magazines (thanks mostly to our coverage of the skulls that were being discovered in Halo 2 campaign maps), and the fact that we were mentioned in an article on Wired News, and you can see why our house was suddenly a crowded one. The increased traffic was a blessing and a curse. It was exciting to have the influx of so many new people with SO MUCH content to share, and the collaboration among that many dedicated [read: fanatical] people was a sight to behold. However, it also meant that our friendly little community of people (our 'small town' feel) suddenly became Gotham City, with all the crap that a huge poplulation produces. Needless to say, our waste management systems were completely overloaded. 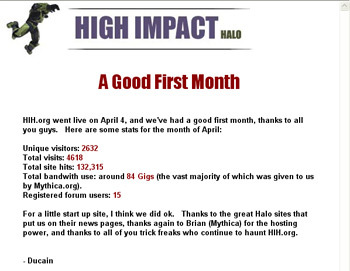 During the summer after the release of Halo 2, our traffic spiked to more than 3 million pageviews a day, which for a small little site like us, was astounding. HIH went through a couple of fairly major overhauls, and gradually the admin staff began to learn some things about putting a website together with more than sweat and gummy bears. We did our best to keep the place friendly, and easy to navigate, but soon we realized that we had evolved into an entirely different creature than what we come to know. That was difficult for some people, and some left because of it. Mostly though, it was a positive change in our outlook, and it forced us to grow in ways we wouldn't have had to otherwise. The administrators and moderators we've had over the years have literally made this place what it is today. We simply would NOT exist without them, and they're a huge group. You guys know who you are. 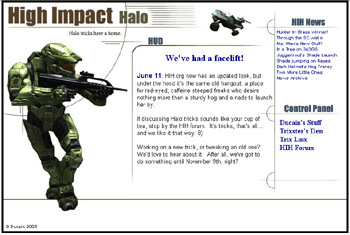 To summarize what we're about here, and to wrap up this already lengthy page, let me just say that High Impact Halo is about having fun with a series of games that we absolutely love, collaborating and hanging out with cool people, and sharing amazing game footage through pictures and video. That's us in a nutshell. We're not a general Halo news site, and why should we be, with sites like HBO out there doing an incredible job of covering that field? We're here for those who look at a warthog and say, "I bet that thing could really fly, given the application of enough explosives." If you're that kind of...person (psycho), well...welcome home.